We all have our favorite sleeping positions — back, side, stomach — but a new study shows our sleeping position may have more benefits than just comfort. Researchers at Stony Brook University believe sleeping on one's side — the most common position in humans and many animals — may more effectively remove brain waste and help reduce the chances of developing neurological diseases, such as Alzheimer's and Parkinson's. Dr. Helene D. Benveniste, principal investigator and a professor in the Departments of Anesthesiology and Radiology at Stony Brook University School of Medicine, has used dynamic contrast MRI for several years to examine the glymphatic pathway in rodent models. The glymphatic pathway expedites clearance of waste, including soluble amyloid beta from the brain. Transport through this pathway is controlled by the brain's arousal level. During sleep or anesthesia, the brain's interstitial space volume expands (compared with wakefulness), resulting in faster waste removal. Humans, as well as animals, exhibit different body postures during sleep, which may also affect waste removal. Therefore, not only the level of consciousness, but also body posture, might affect cerebrospinal fluid-interstitial fluid (CSF-ISF) exchange efficiency. In their recent study, the researchers used dynamic contrast MRI and kinetic modeling to quantify CSF-ISF exchange rates in anesthetized rodents' brains in three positions — lateral (side), prone (face down) and supine (face up). To validate the MRI data and assess the influence of body posture on clearance of amyloid beta, they used fluorescence microscopy and radioactive tracers, respectively. The analysis showed that glymphatic transport was most efficient in the lateral position, compared to the supine or prone positions. In the prone position, when the rat's head was in the most upright position (mimicking posture during the awake state), transport was characterized by retention of the tracer, slower clearance and more CSF efflux along larger caliber cervical vessels. The optical imaging and radiotracer studies confirmed that glymphatic transport and amyloid beta clearance were superior in the lateral and supine positions. 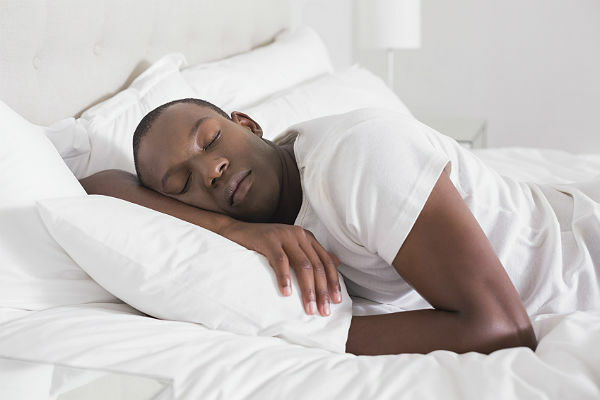 Researchers propose that the most popular sleep posture (lateral) has evolved to optimize waste removal during sleep and that posture must be considered in diagnostic imaging procedures developed in the future to assess CSF-ISF transport in humans. The study further supports the concept that a distinct biological function of sleep serves to clean up the mess that accumulates while we are awake. Many types of dementia are linked to sleep disturbances, including difficulties in falling asleep. It is increasingly acknowledged that these sleep disturbances may accelerate memory loss in Alzheimer's disease. This finding brings new insight into this topic by showing that our sleeping position is important. The researchers cautioned that while the research team speculates the human glymphatic pathway will clear brain waste most efficiently when sleeping in the lateral position as compared to other positions, testing with MRI or other imaging methods in humans is a necessary next step.